Waukesha Metal Products considers custom enclosures one of our specialties. 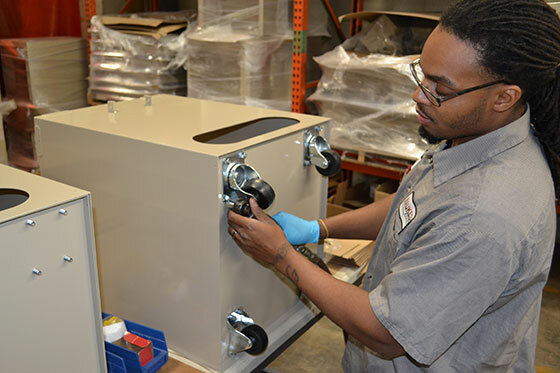 Whether it’s a small aluminum box, a large metal chassis, cabinets, or a sheet metal box, we’ve got years of experience fabricating high quality, tight tolerance metal enclosures. We also manufacture top-of-the-line custom NEMA enclosures for electrical components as well as chassis for automotive electronics components. With a full selection of value added services, our team of expert fabricators can take your requirements and turn them into finished, top-quality products. Working with Waukesha Metal Products to fabricate your enclosures provides several advantages compared to adapting an off-the-shelf product. First, the enclosure will be custom made to match your exact specifications. Trying to modify a pre-built product is likely going to result in a significant amount of compromise. Second, even if you can successfully repurpose an off-the-shelf enclosure, it is most likely going to be less cost-efficient in the long run than having one produced to match your project’s specific needs. In addition, many enclosure projects require value added services such as machining, welding or painting (see more about all of our value added services here). When those services are needed, the Waukesha Metal Products team can streamline the process by overseeing the quality and efficiency of the entire supply chain. Our aluminum enclosures are both intricate and lightweight without sacrificing too much strength, making them ideal for less intense environments where flexibility is key. We’re very experienced manufacturing custom aluminum boxes with multiple components where each part must be produced with extreme precision. Of course, many of our customers take aluminum enclosures that we produce and use them to house complex solutions. Enclosures made from stainless steel tend to be more durable, making them a better fit for more extreme environments and applications. Stainless steel also provides improved durability so enclosures require less maintenance during their lifespan, lowering costs in the long run.